"No man with a good car needs to be justified"
The good thing about examining the complete works of a specific director, particularly one as storied and prolific as John Huston (Jhon Huston, as he is credited on Wise Blood), is that you occasionally fall upon a real oddity that doesn't fit into their filmography. Wise Blood is one such example. Hazel Motes (Brad Dourif) is a young man who returns home from war (no specific war, just "war") to discover that his family home has fallen into disrepair and his domineering preacher grandfather (Huston, shown bellowing like a good 'un in some great flashbacks) has died. Hazel sets out for the big city, where he meets a manic young man who believes that his "wise blood" makes him akin to a prophet (Dan Shor), a blind preacher (Harry Dean Stanton) and his daughter (Amy Wright), who each become attracted towards or disdainful of Hazel as he begins to preach his gospel of the Church of Truth Without Christ, a church that preaches a nihilistic belief that there can be no such thing as sin and redemption, so there is no need for anyone to be damned. Based on Flannery O'Connor's novel, the film is incredibly odd, not merely in its collection of grotesques - par for the course in a Southern Gothic allegory - but in its style and tone; it's based on a book written in the 50's, clearly set in the 70's but with characters who act like they are from the 30's. It's a mish-mash of styles that reminded me of Francis Ford Coppola's Rumble Fish, which also combines different eras to create a singular, dreamlike world. 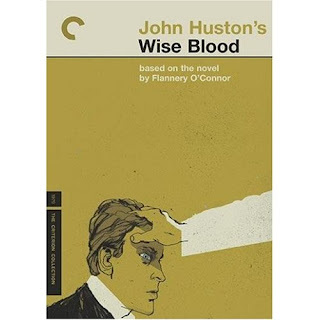 Wise Blood also shares with Rumble Fish a philosophical tone as both films revolve, in one way or another, around young men trying to make sense of the world who are confronted with differing existential ideas. Tonally, the film feels more like a movie that would have been made 10 years later than it was. It's matter-of-fact approach to its bizarre characters reminded me of Jim Jarmusch's Dead Man and other mid-90's American Independent films. The anachronistic combination of the very 70's visual style and the not at all 70's tone was really disconcerting. Religion and spirituality are, quite obviously, the main concerns of the film. Hazel's grandfather preached that Jesus would come and get him so violently when he was a child that Hazel equates salvation with a form of punishment - we see him as a child putting rocks in his shoes and wetting himself during a sermon because he fears Jesus so much - so, after his experiences in the war, he decides that the only way to save his soul would be if he had no soul to begin with, hence the Church of Truth Without Christ. The film is, in essence, about Hazel's crisis of faith and how he is perceived by those around him. he's a man disappointed with Christ who eventually becomes disappointed with the world as well. Brad Dourif, who may be one of my favourite actors, is superb as Hazel. He gets just the right balance of wiry anger, confusion and rigorous self-belief that such character in the midst of a metaphysical quandry needs to be compelling and he is able to tell us so much just through his striking blue eyes. He's only outshone by Ned Beatty, who shows up as a preacher who wants to exploit Hazel for money, and repeats his trick from Network of showing up for about five minutes but completely stealing the film in that time. For all its positives, I found the film to be somewhat indigestible. It tries to cram a lot of religious subtext and psychological trauma into a very short space of time and I don't think it quite manages it. Huston was a very literal adapter and when he was adapting fairly straight-shooting novels like The Maltese Falcon he was in his element, but he always seemed to struggle when adapting books which were deeper or more nuanced (for another example, check out Under The Volcano). What he does manage to get across to the viewer is fascinating, but you get the feeling that the book would expand these ideas more. Case in point; Hazel's car, which is very key to the novel and increasingly symbolic as time goes on, is kind of sidelined in the film and the lack of substance given to it makes its destruction towards the end of the film far less impactful than it needs to be and makes the aftermath of its destruction seem absolutely insane, rather than symbolic and it ends up losing the thematic significance that it needs to justify the rest of the film.